English-to-Spanish Live Translation will be available for the two Plenary Sessions and the General Assembly. #IAMCR2018 will be using Interprenet (www.interprenet.net), an interpretation service. It is delivered via an app and Wi-Fi to your Android or iOS device. 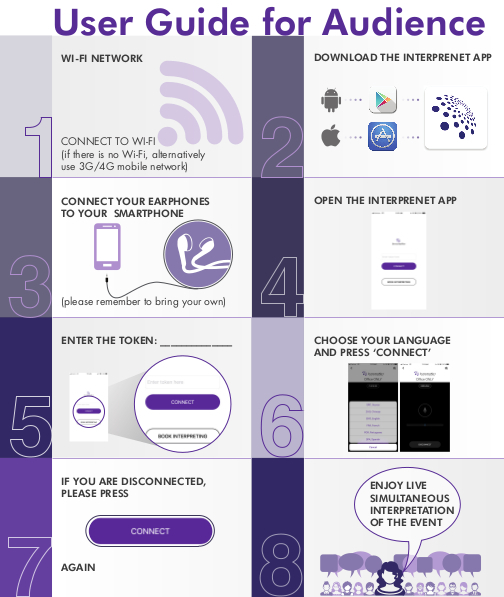 For instructions on how to use Interprenet, see the image below or download the user guide with instructions for downloading and use. Please make sure to bring your phone's headphones if planning to use the interpretation service.